Zetsche cautioned against stricter CO2 emission regulations for trucks and attacked the recent EU-Korea Free Trade Agreement. FRANKFURT (Reuters) – The European auto industry does not expect a quick recovery this year, said Dieter Zetsche, president of the Brussels-based industry body ACEA. 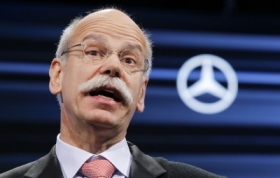 Zetsche, who is also CEO of Daimler AG, warned that sales of commercial vehicles that closely follow the economic cycle would "at best be flat" after dropping by one-third in 2009. "If the economy looks better in 2010, it's only when compared with 2009. And that's why it is so critically important not to endanger whatever little stabilization has been achieved," he said in prepared remarks at the 2010 annual ACEA reception. Zetsche said the auto industry accounts for 35 percent of all European manufacturing employment and nearly 380 billion euros ($516 billion) of tax revenue. Amid the bleak outlook for the commercial vehicles sector -- where new registrations fell more than 32 percent to some 1.71 million trucks, vans, buses and coaches last year -- Zetsche cautioned against stricter CO2 emission regulations. "Legislation needs to be reasonable and the target level of 135 grams CO2 per kilometer for light-commercial vehicles in 2020 simply isn't. The tailpipe target system for passenger cars just won't work for light trucks," the ACEA president explained. Zetsche said the shape of the auto industry would be transformed by the game-changing trend toward zero-emission mobility in the future and European governments needed to actively participate in the process. "The U.S., China or Japan -- and a number of other nations -- already have well-coordinated activities to encourage research and development investment for sustainable mobility, and they've reinforced these during the crisis," he said, calling for more loans from the European Investment Bank. Zetsche also attacked the recent EU-Korea Free Trade Agreement as not yet "passing the test" for being fair. "Too many non-tariff barriers still exist for EU vehicles exported to South Korea and there is no guarantee against new ones being introduced," he said. Analysts say South Korean carmakers control about 94 percent of their market, the lowest level of penetration among any developed country, due at least partly to local regulators that do not recognize international test cycles and standards and force imported cars to undergo costly modifications.